Hundreds of distribution companies across North America – already powered by D3 software - are experiencing the benefits of a fully automated ERP solution. Whether your strategic objective is to move more volumes, increase productivity, streamline operations, improve customer service or to cut costs -- D3 Software puts the business building tools in your hands. 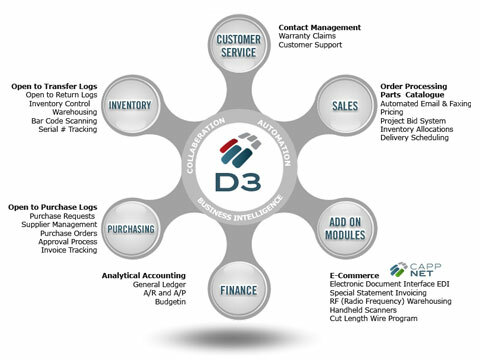 Click on the diagram below for further details on D3’s features and functionality. CLICK HERE to contact a knowledgeable CAPP Associates ERP expert to start building your own D3 business automation solution today.